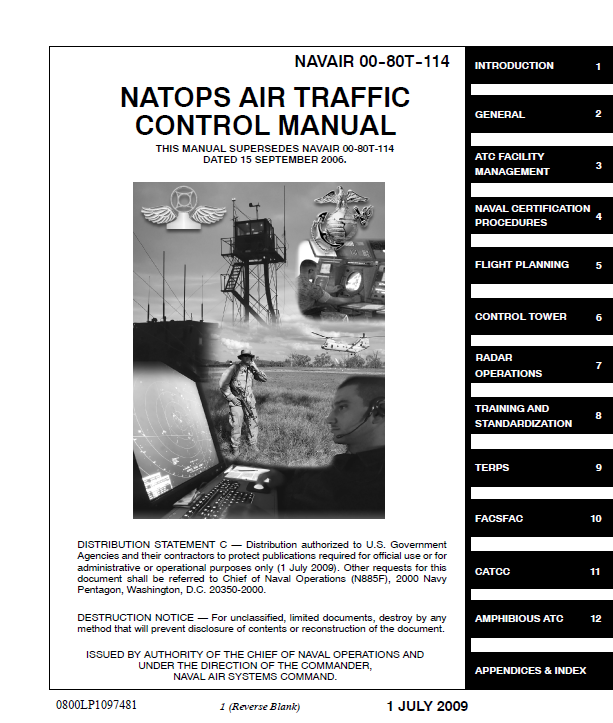 This manual contains information on administrative and operational procedures for all Navy and Marine Corps units providing air traffic control services and applies on a worldwide basis. Marine forces tactical air traffic control is provided by Marine Air Traffic Control Detachments (MATCD). Each MATCD is organized and equipped to provide continuous all-weather air traffic control services to an independent and geographically separated main air base or air facility and/or remote air sites or points. These services include airport traffic control, low approach and landing, and terminal area control services. To the extent possible and consistent with the ATC requirements of the area to which deployed, the functions, training, qualification, and certification for Marine forces tactical ATC units shall be as prescribed in this manual.